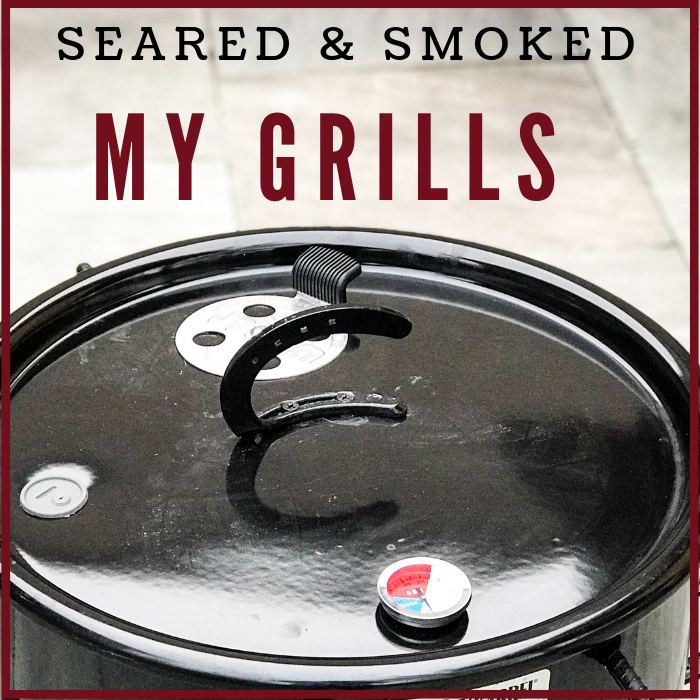 For many years I leaned on store bought BBQ sauces for all my grilling and smoking. After realizing that most of them are laden with corn syrup and other ingredients that I do not even recognize, I started learning how to make my own. 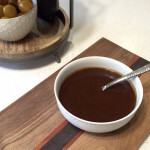 After years of experimentation, I would not share this recipe if I truly did not think it as an Awesome Homemade BBQ Sauce with a nice sweet heat. 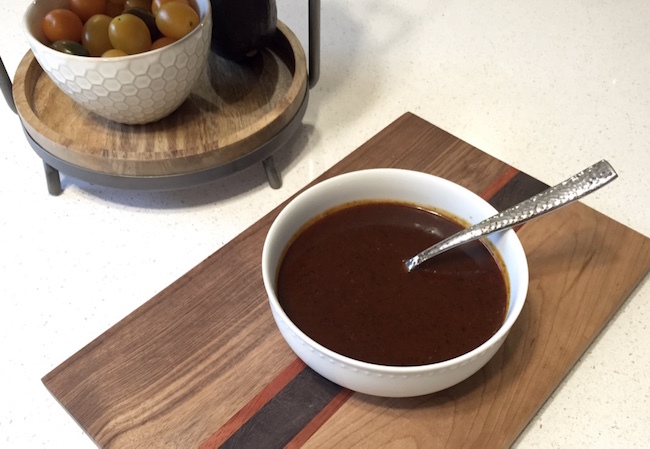 Give this a try and you will have a perfect BBQ sauce for pork, chicken, and beef. 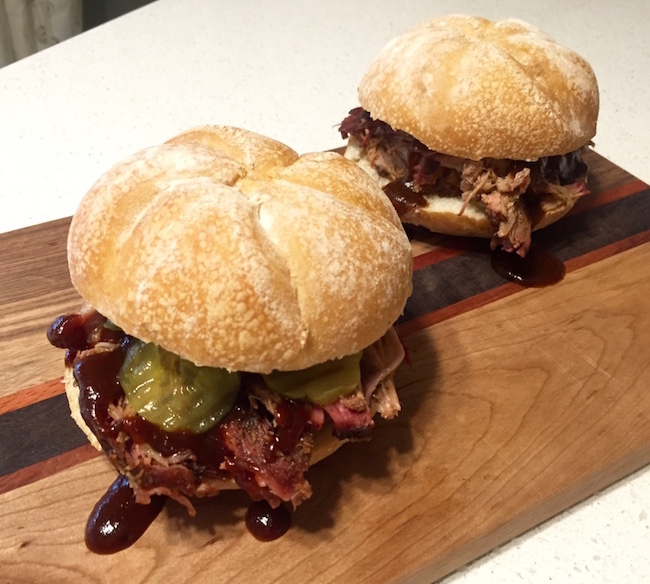 I love it with Ribs, Pulled Pork Sandwiches, and Smoked or Grilled Chicken. I have had a ton of positive feedback from friends and patrons I have served at several catering gigs. Give this a shot….. I think you will love it! 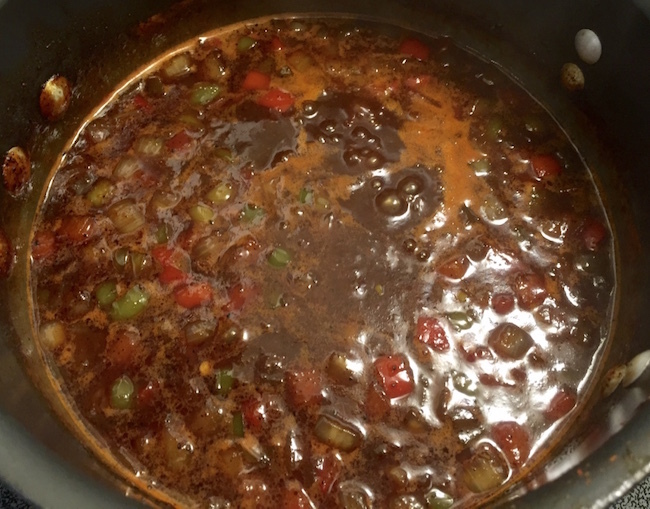 more jalapenos, white pepper, and black pepper when brewing the sauce. 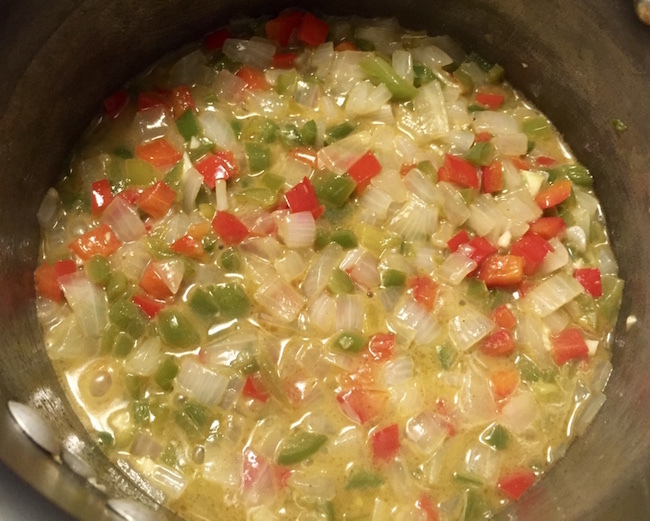 I always taste it after it has simmered with all ingredients and then add more heat if needed. 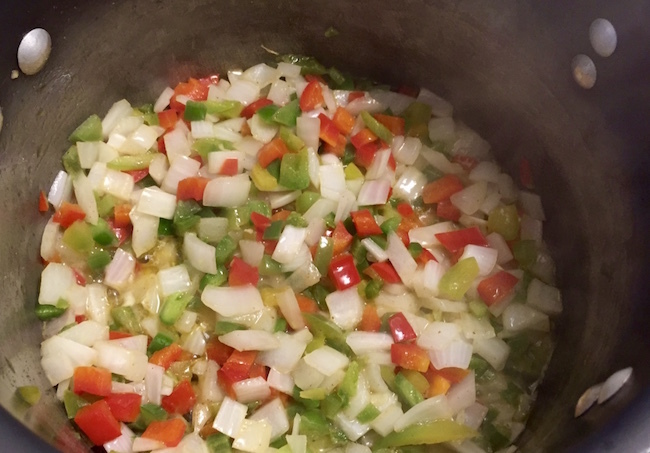 The sauce comes together in 4 general steps…. Blend together to make a nice smoooooth sauce. I use a Cuisine Art hand blender that works great for this. I then bottle it up and store it in the fridge for several months. Because it has a good amount of vinegar you should be able to keep it for 90 days in the fridge without a problem. Give this a try and leave me a comment to let me know how you like it. 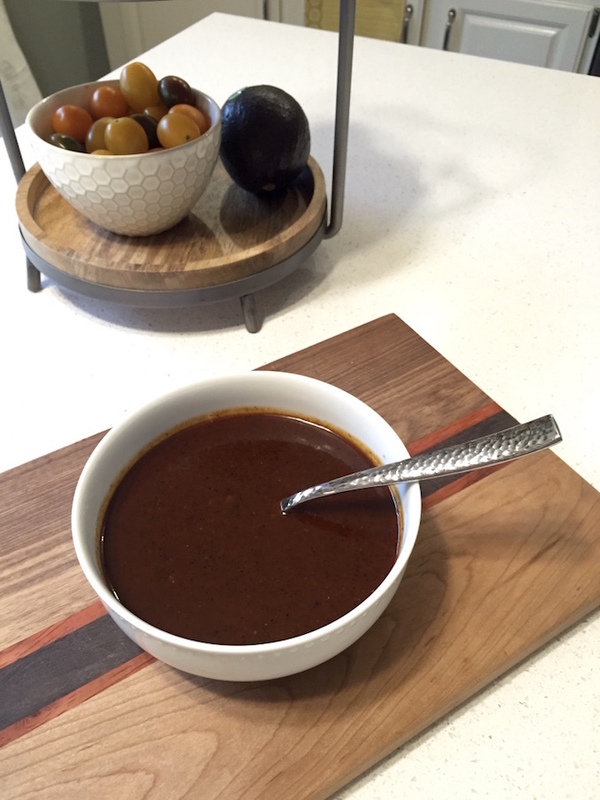 Easy to make Homemade BBQ Sauce with a nice sweet heat. 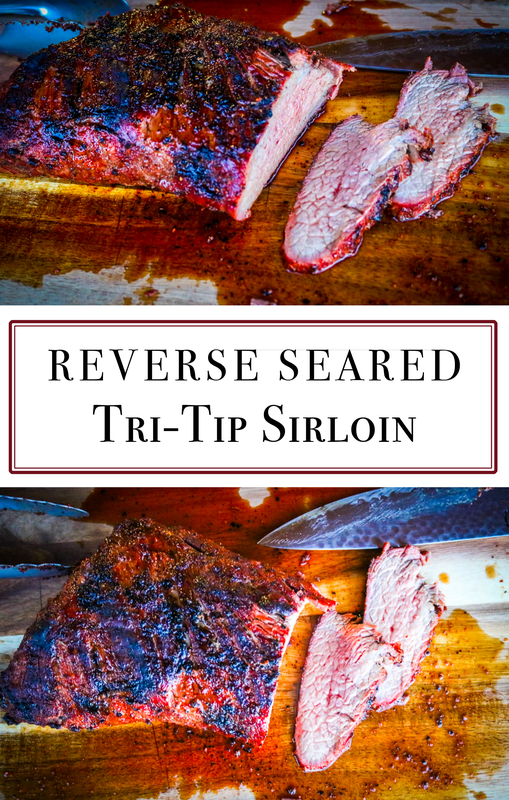 Give this a shot at home and you will say goodbye to your store bought sauce laden with questionable ingredients. Melt butter with olive oil in a large sauce pan. Add the water and other wet ingredients and stir together. Bring to a simmer over medium heat. 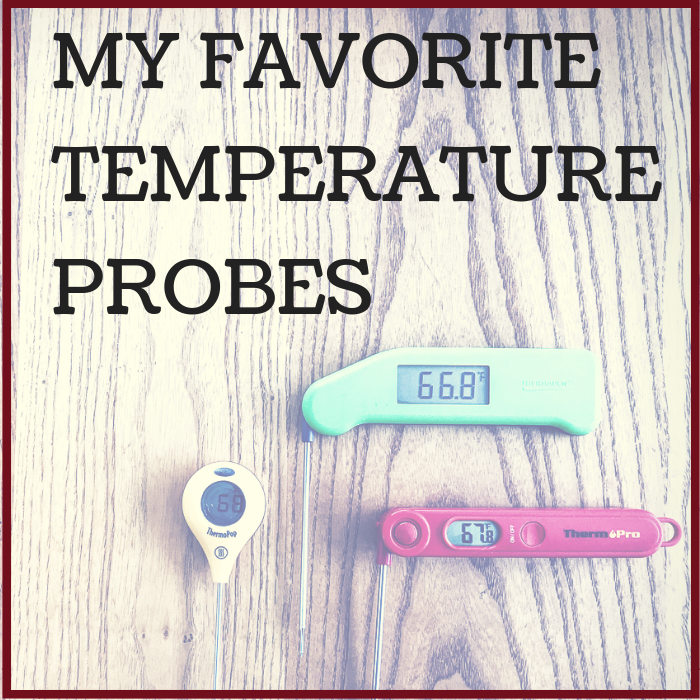 Reduce to a lower temperature to simmer and stir every 5-10 minutes. Simmer for a total of 45 minutes. 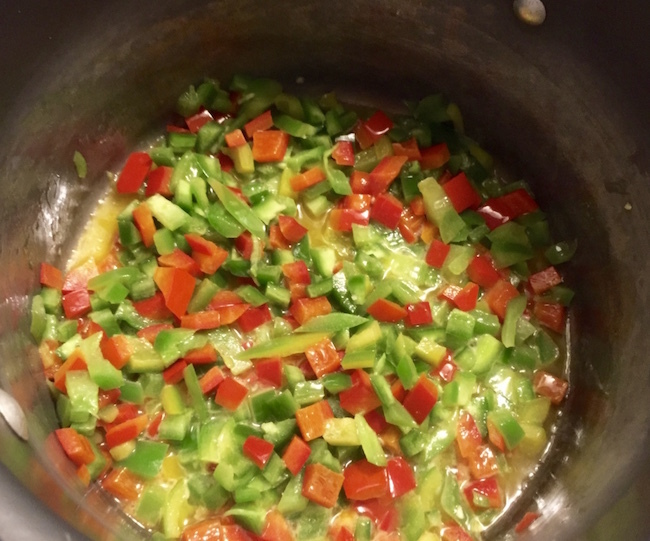 Blend the sauce mixture with a hand blender and then simmer more if needed to thicken. Keep in mind it will thicken up as it cools off. Add more or less Jalapeno, Black Pepper, and White pepper, depending on how spicy you like your sauces. The sauce will mellow out over time, getting less spicy over the first few days of storage. 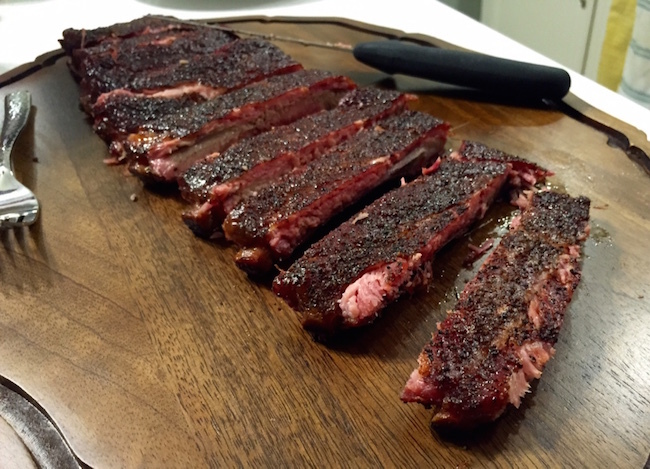 These ribs are tender with a nice bark that packs a lot of flavor without being overwhelming. 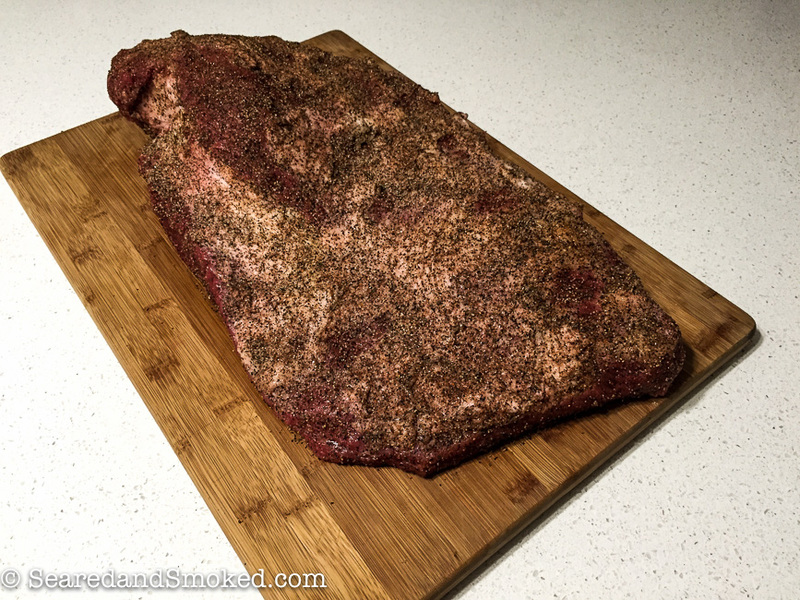 The rub is simple and the cooking process is simple too, which I love for the ability to repeat on a consistent basis. 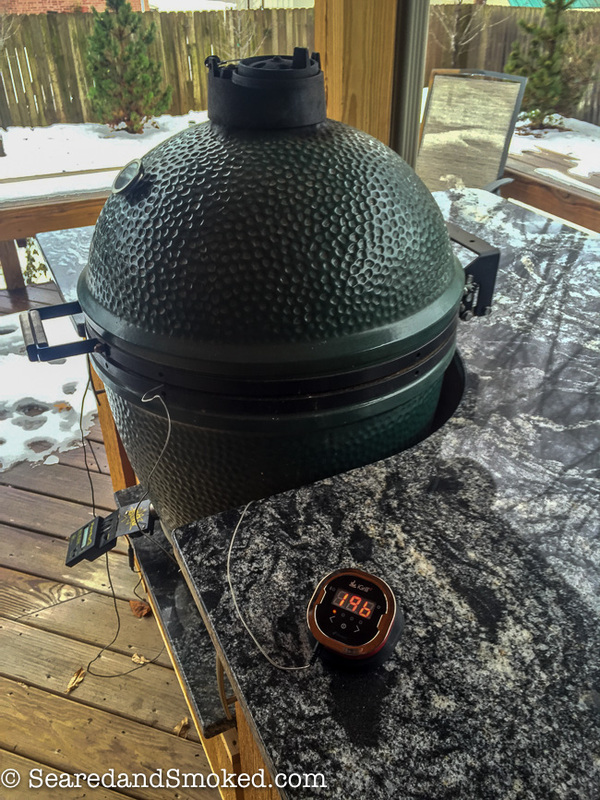 I am using a Large Big Green Egg for this smoke, so keep in mind that other smokers can change cooking time, etc. Here is the basic rundown…. 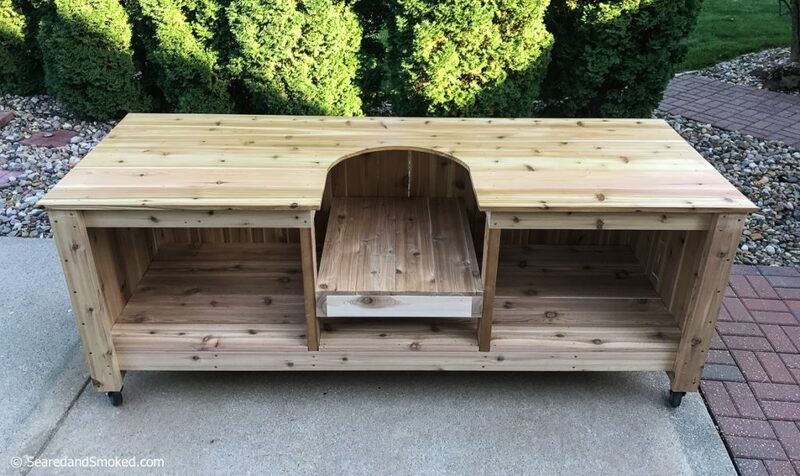 Purchase a fresh rack (or more!) 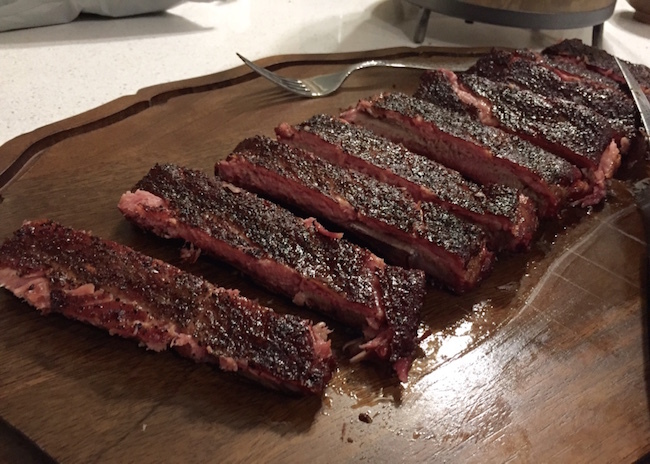 of St. Louis Spare Ribs. The important part is FRESH! 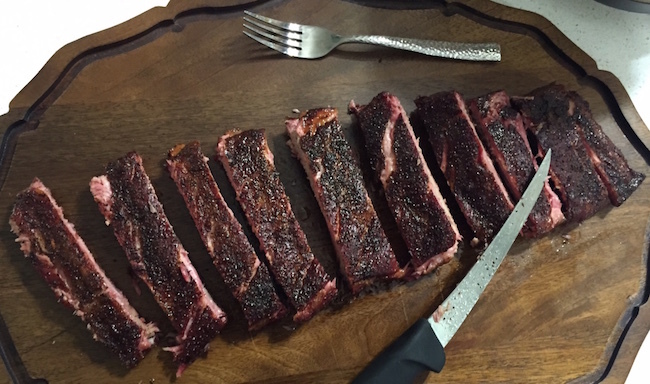 Here in Des Moines, Whole Foods has the best spare ribs I can find. They are expensive, but worth every penny. To expect good results…. buy the best meat you can find. 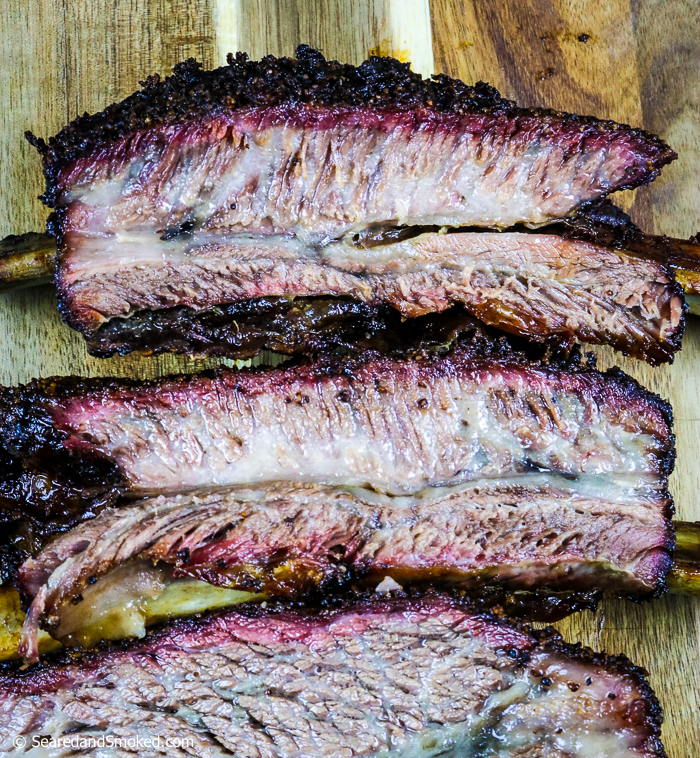 Trim any extra fat or pork that looks flappy off the ribs. For a good overview of St. Louis style spare ribs, check out this article on seriouseats.com One note: I have not been removing the membrane on the back of the ribs for higher temperature cooks. 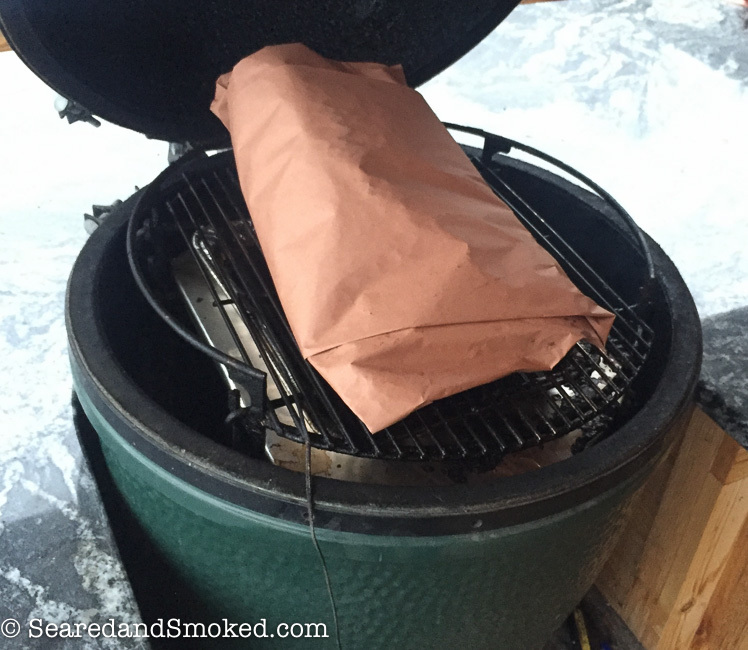 It is barely noticeable and I think it keeps the ribs moist during the cook. 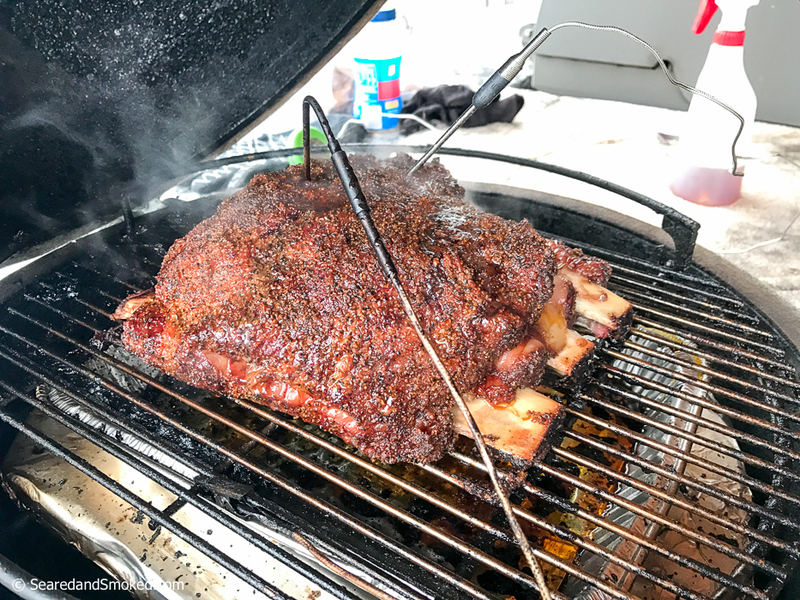 Smoke the ribs meat side up for 5 hrs at 275 degrees. 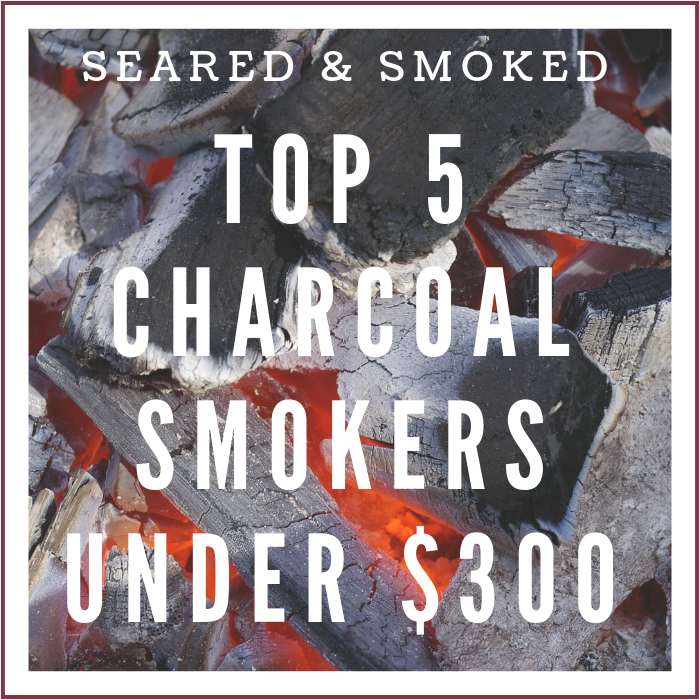 Using lump charcoal as your heat source, add one chunk of fruit wood to start your smoke. 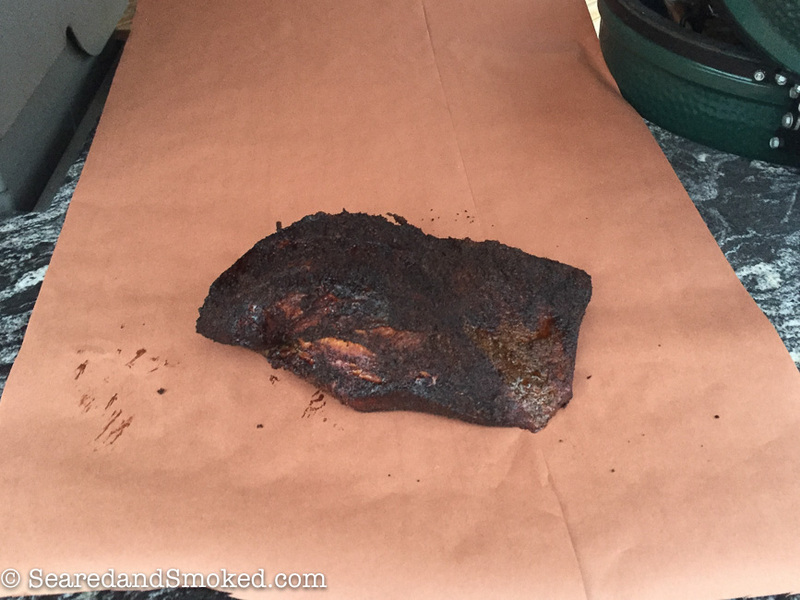 Then add one more chunk of wood after 1 hour of smoking. 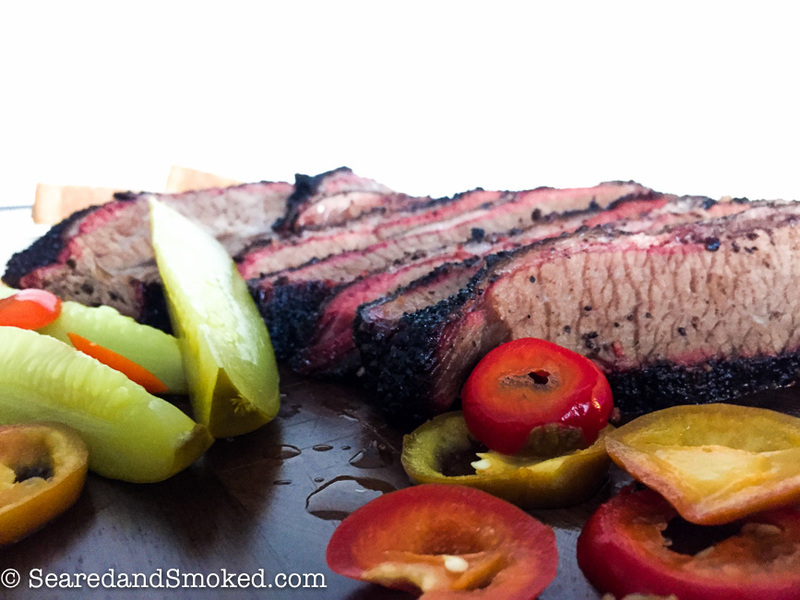 Then rely on the charcoal to provide the rest of the smoke flavor. 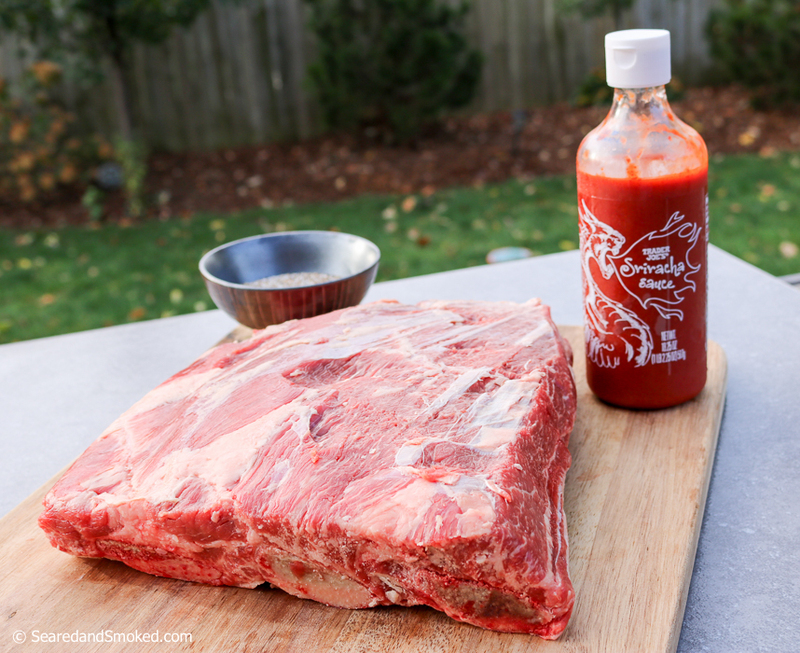 Starting at the 1.5 hour mark, spray the ribs generously every 30-45 minutes with the apple cider vinegar and water solution. Open the lid and spray quickly, to avoid a lot of heat loss. 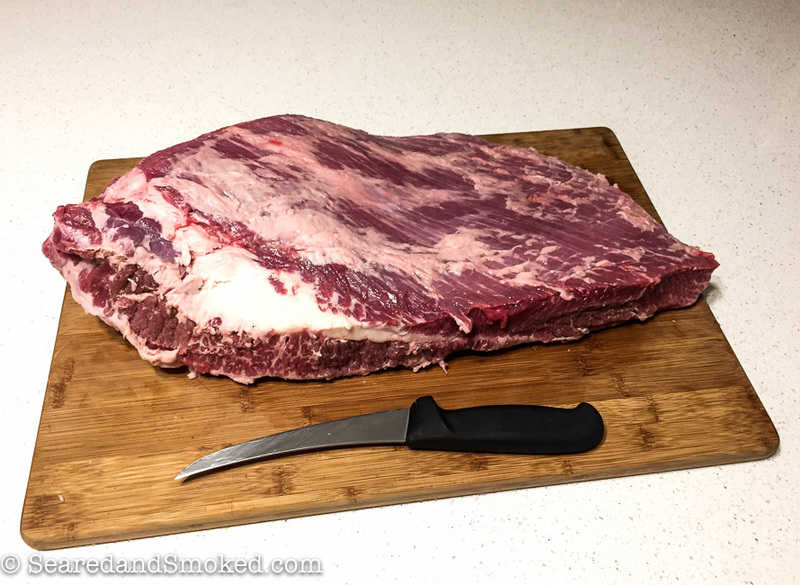 Check the ribs starting at 4.5 hrs for tenderness. 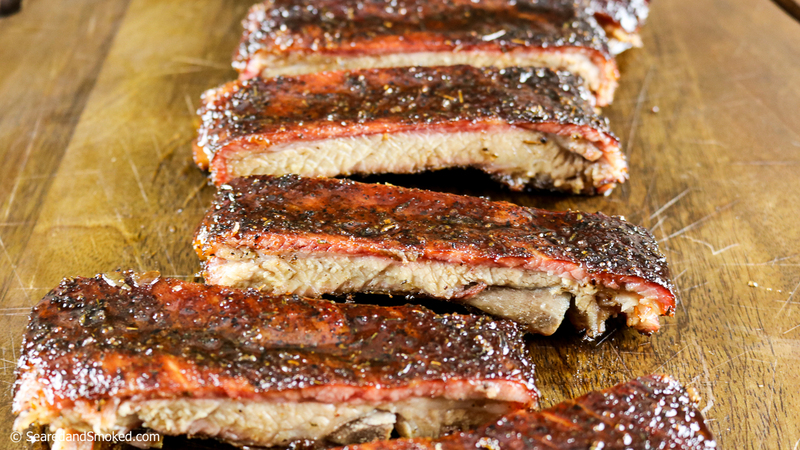 Depending on how thick your ribs are, they may take less time or a little more. 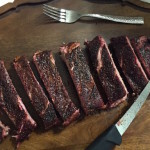 When you pick up the ribs at the halfway point with BBQ tongs, the ribs should bend easily and the bark should start to tear a little bit as they bend. 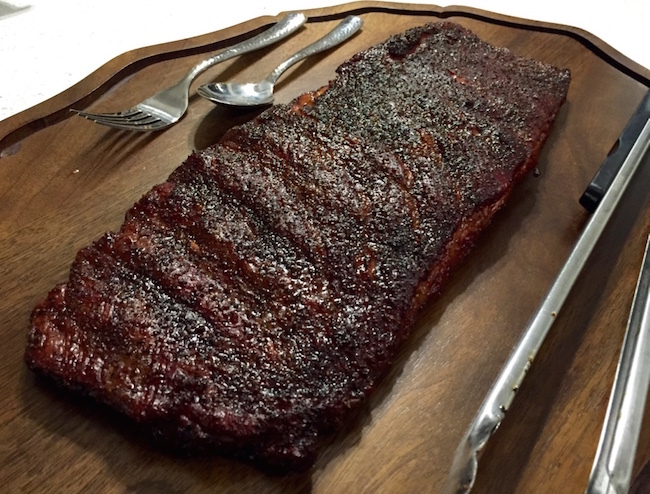 2 Slabs of St. Louis Style Ribs get fresh ribs from the counter - NOT the ribs wrapped in plastic and previously frozen! 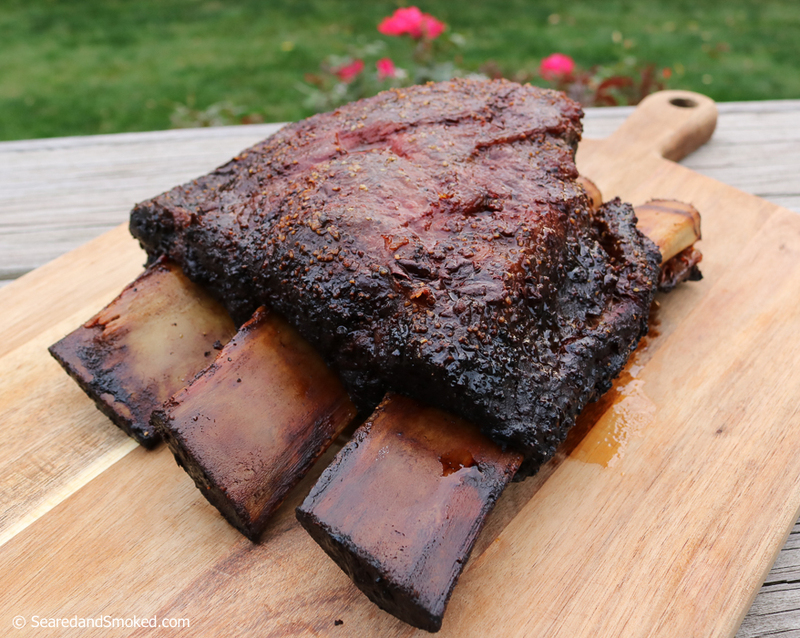 Season both sides of the ribs with the rub. 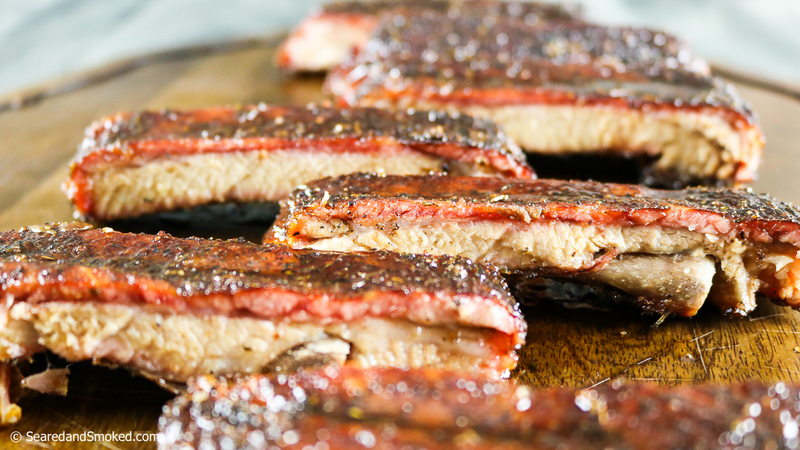 Approximately 1.5 tablespoons per large meaty rack of ribs. 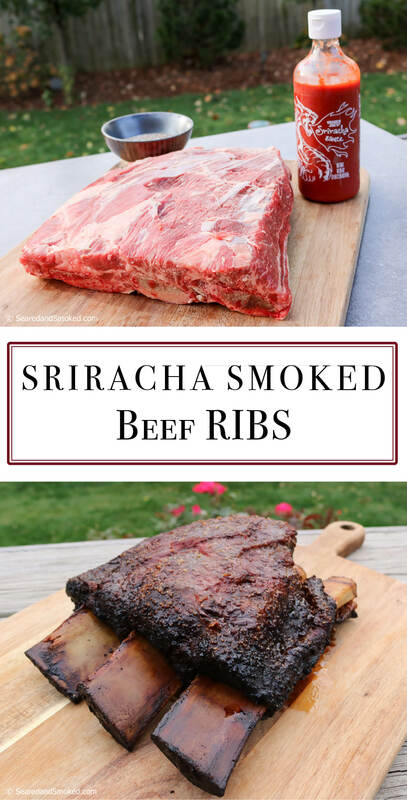 Less if your ribs are on the thinner side. 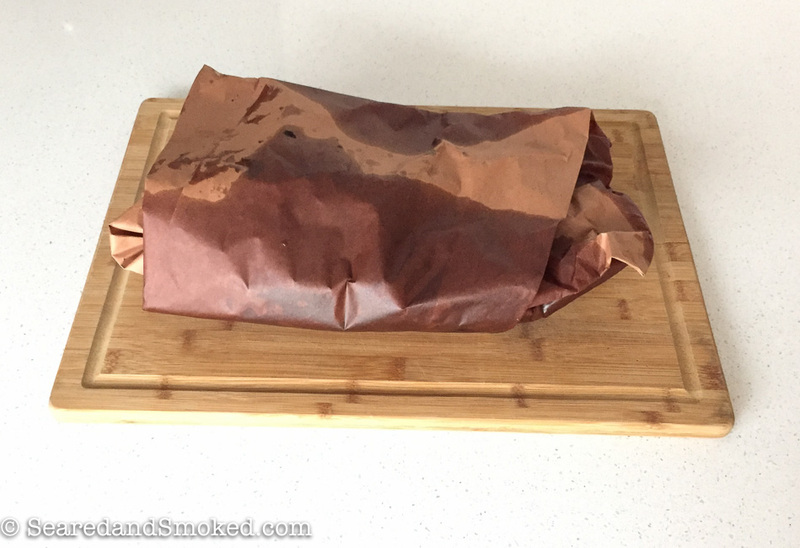 Add one chunk of fruit wood to the smoker and place ribs on smoker meat side up for 5 hrs, dependent on thickness of ribs. At the 1 hr mark add 1 more chunk of fruit wood. 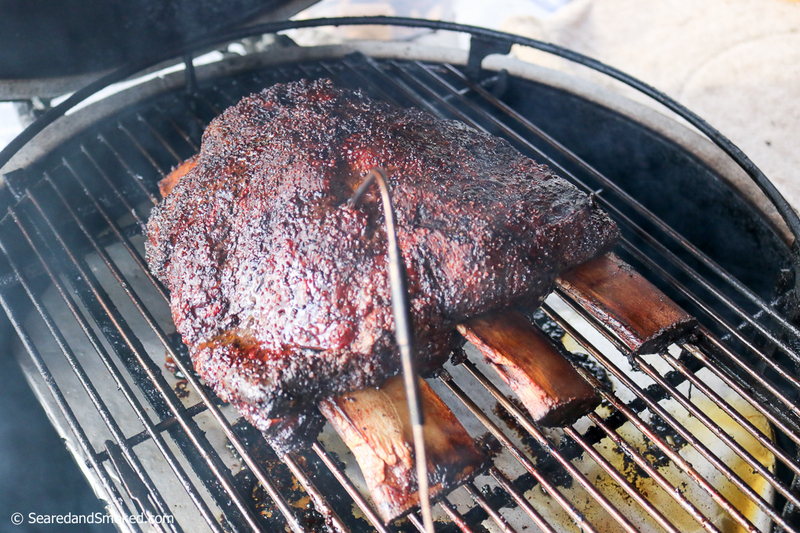 At the 1.5 hour mark, spray the ribs with the Rib Mop Spray. 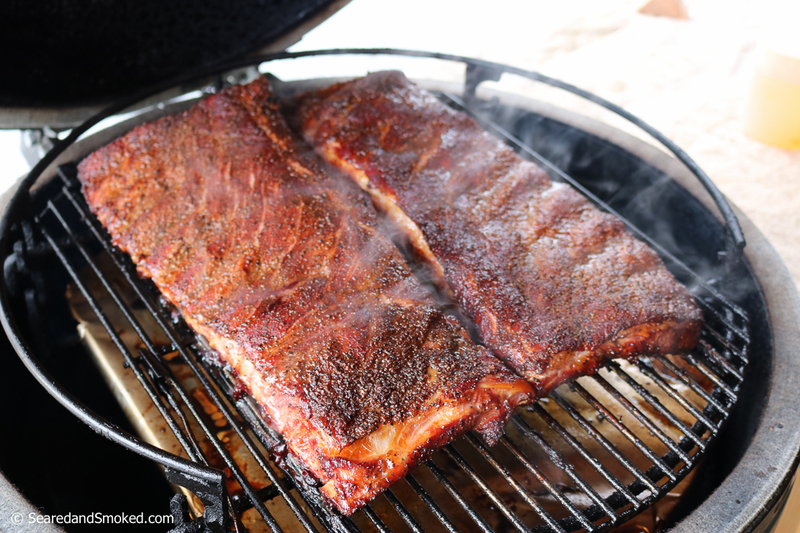 Repeat every 30-45 minutes until the ribs have been smoking 4.5 hours. Check for the ribs every 30 minutes at the 4.5 hour mark to see if they are done, continuing to spray the ribs with the Rib Mop Spray. 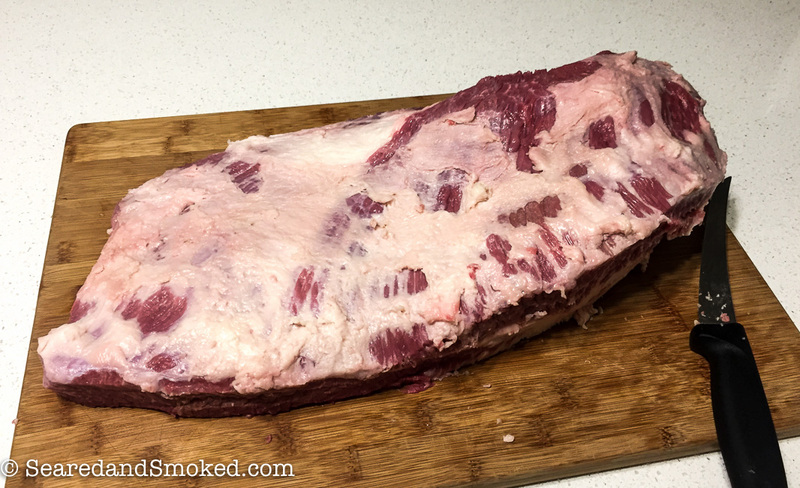 You know your ribs area ready to take off when.... you pick up the ribs with tongs, the ribs should bend easily at the halfway point and the bark should start to crack slightly as the ribs bend. 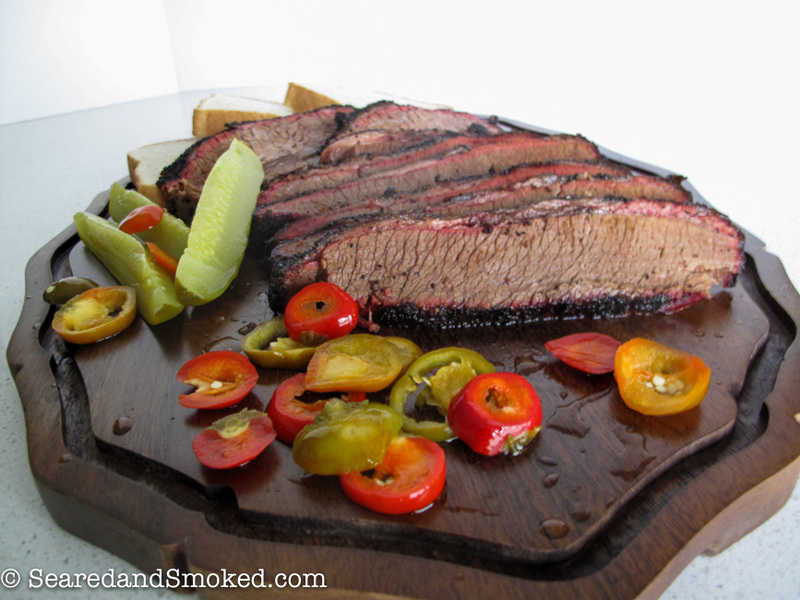 Spray one last time and pull from the smoker to rest for 5-10 minutes. 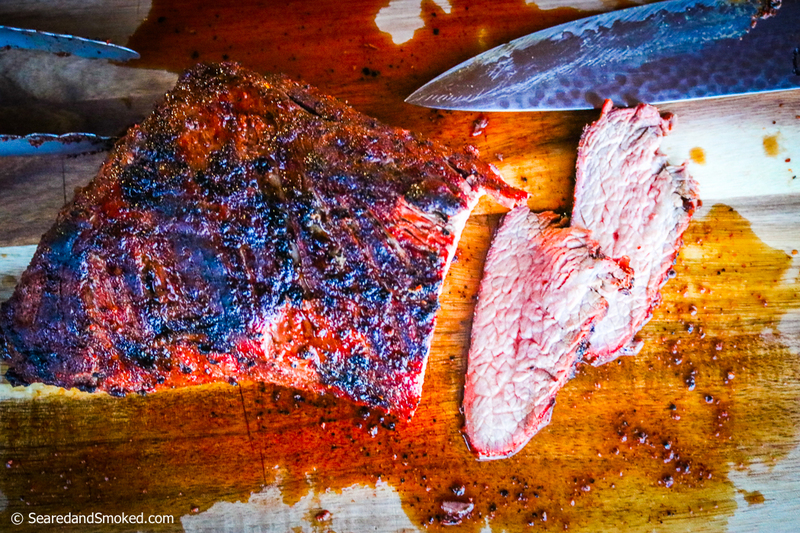 Flip over the ribs meat side down to cut between the bones more easily. 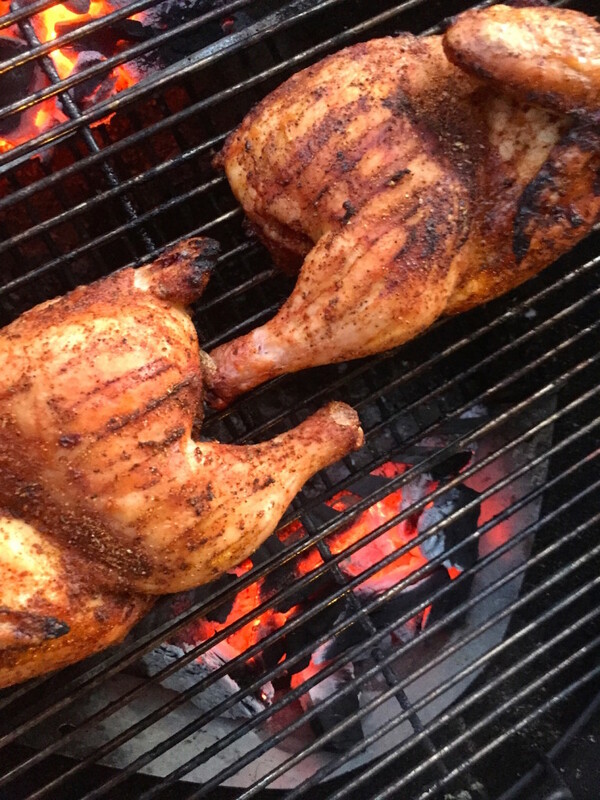 Tonight we are grilling a whole chicken on the grill, with one catch…. we are splitting the chicken in half to make the process easier. Sometimes making the process easier sacrifices results, but not in this case. I actually enjoy half-chickens just as much as roasted whole chickens. 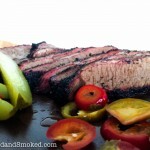 It allows for uniform cooking and extremely juicy tender meat. 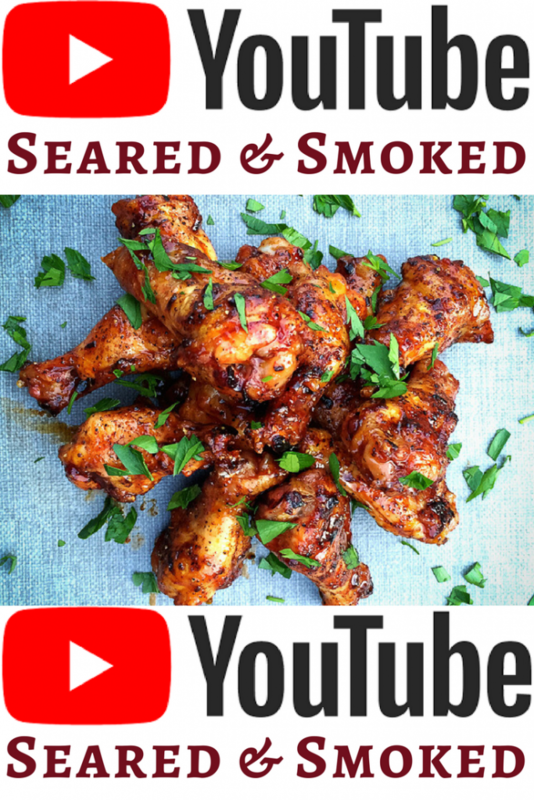 If you like chicken you will love this. 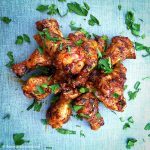 If you are on the fence about chicken, this recipe will move you to the chicken side of the fence. The delicious side. 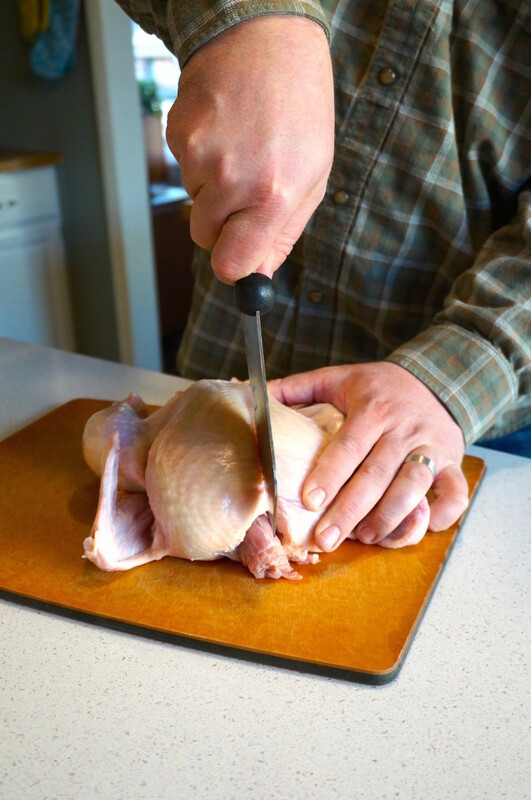 To split the chicken, you need a nice sharp knife with some heft to it. 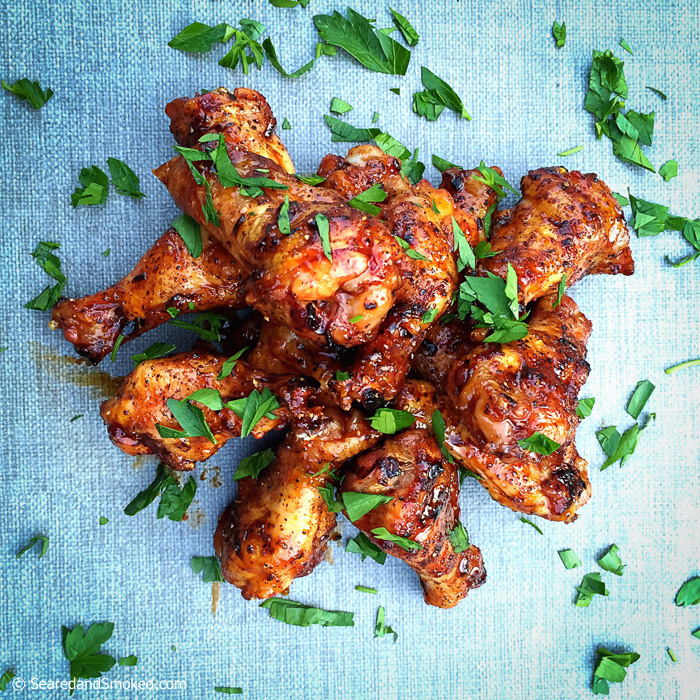 The best way to do it is to cut through the chicken just right or left of center. By going just left of right, you avoid most of the breast bone and it is a little easier to cut through. I find using a serrated edged knife works a little better too. Now, just commit and slice through with some aggression. 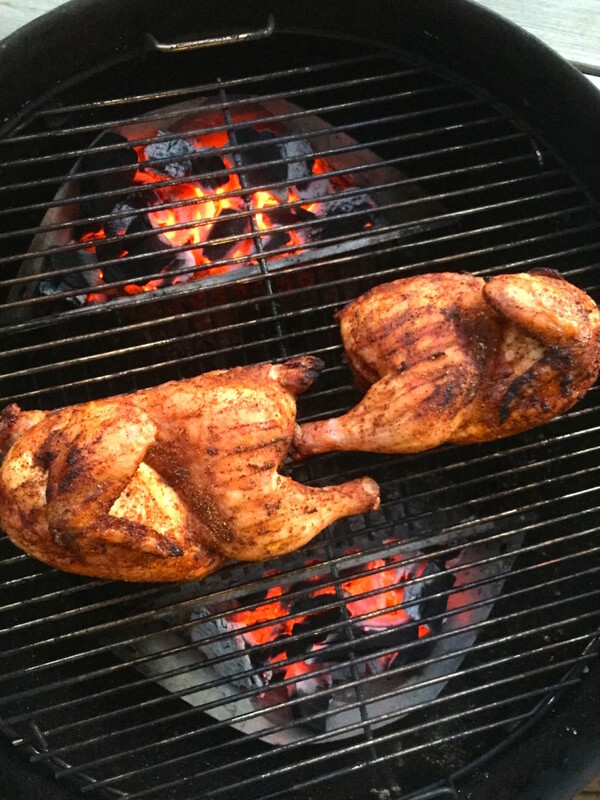 After you tackle splitting the chicken, season your half chickens on both sides heavily with a delicious rub. Tonight I am using my Lovin Everything Rub. It brings a little love to everything it touches. It is truly good on about everything and works great on chicken. 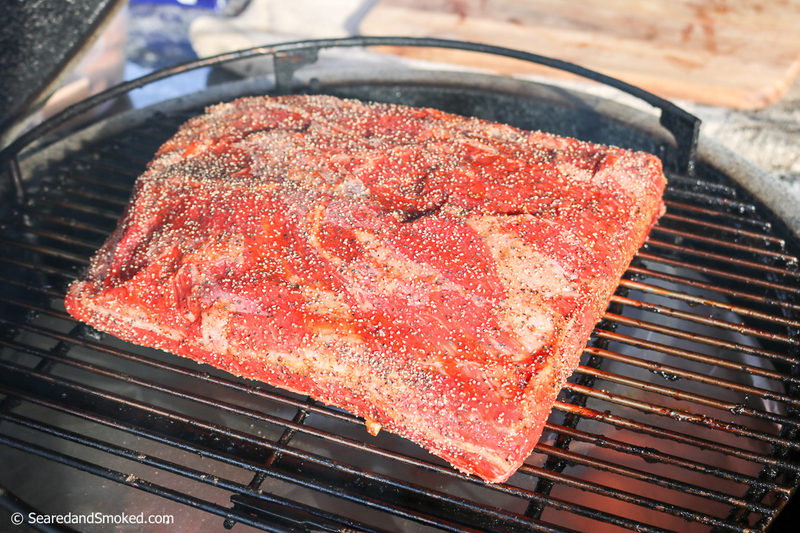 Rub heavily and get the grill started for indirect heat at 400 degrees. 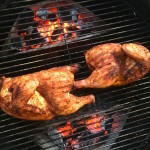 Once the grill is hot, put the chicken on the indirect heat side of the grill, skin side down. 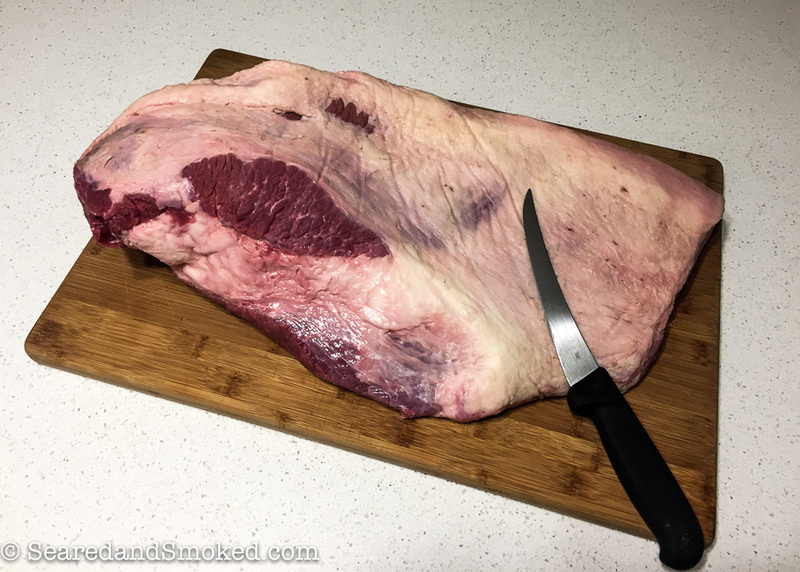 Cook for 20 min and then flip skin side up. Cook for another 20 min and then rotate the chicken for even cooking. Cook for another 20-30 minutes and then check internal temperature. Pull the chicken off when at 165 F or cook a little longer if you want the skin crispier. 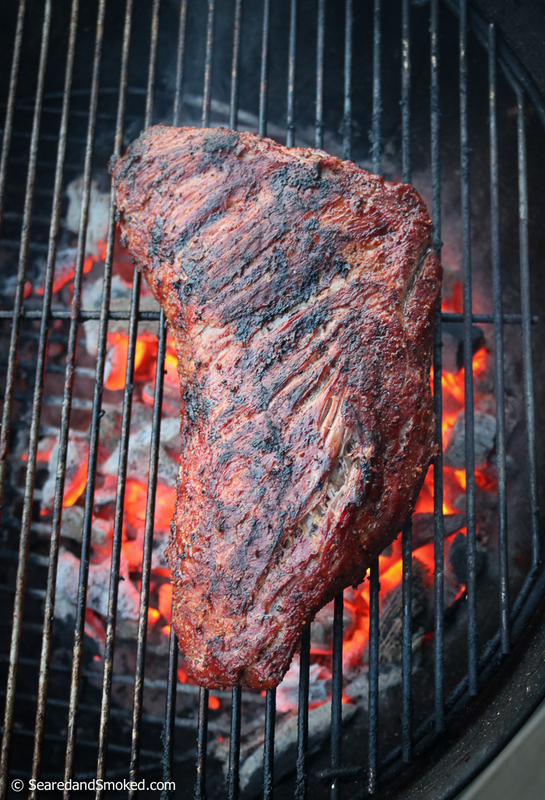 Then pull off the grill to rest for 10 minutes. 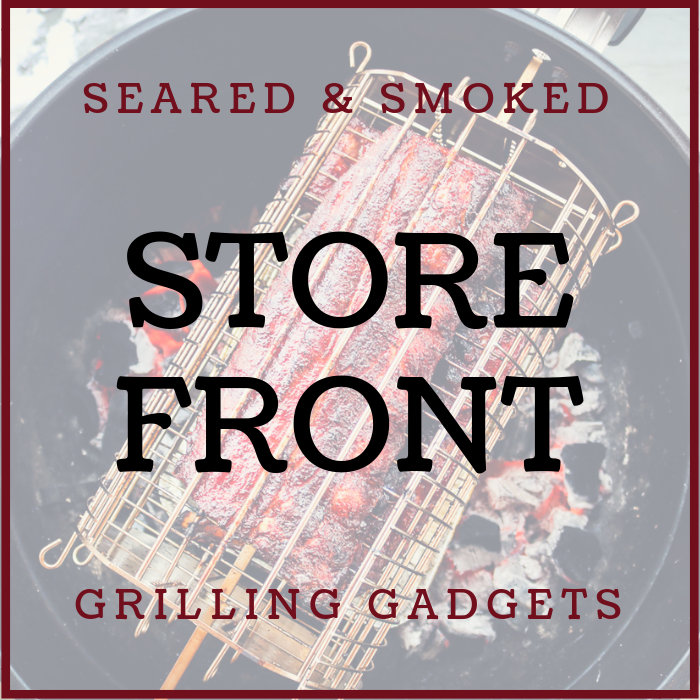 Cut into pieces for serving and enjoy the flavor of the grill. 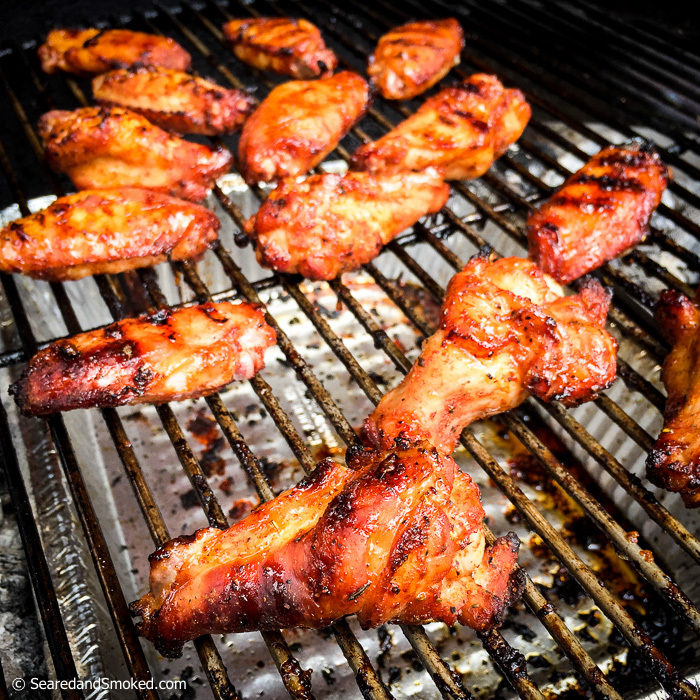 This will NOT be your last Half Chicken on the Grill, I would bet. 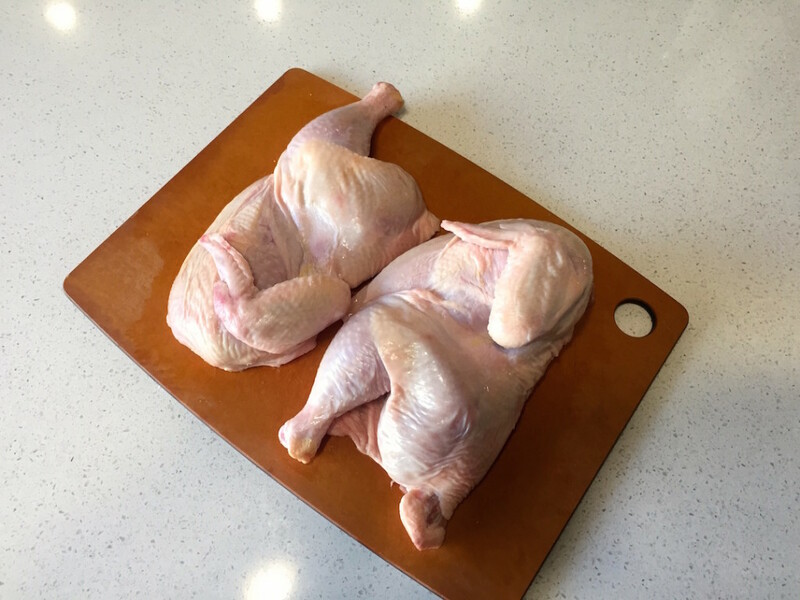 Split a whole chicken in half to create the most delicious chicken that is easy to cook in one hour. 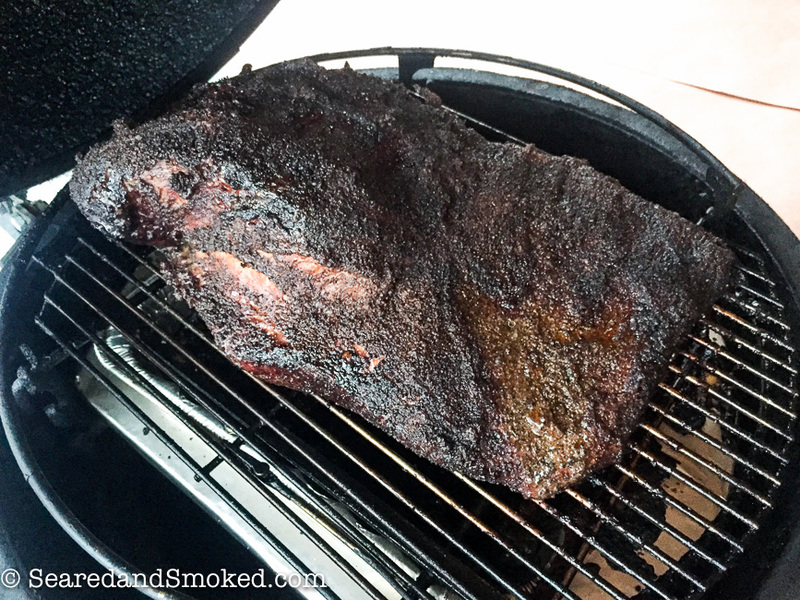 Rotate, still skin side up and grill for 25 min. 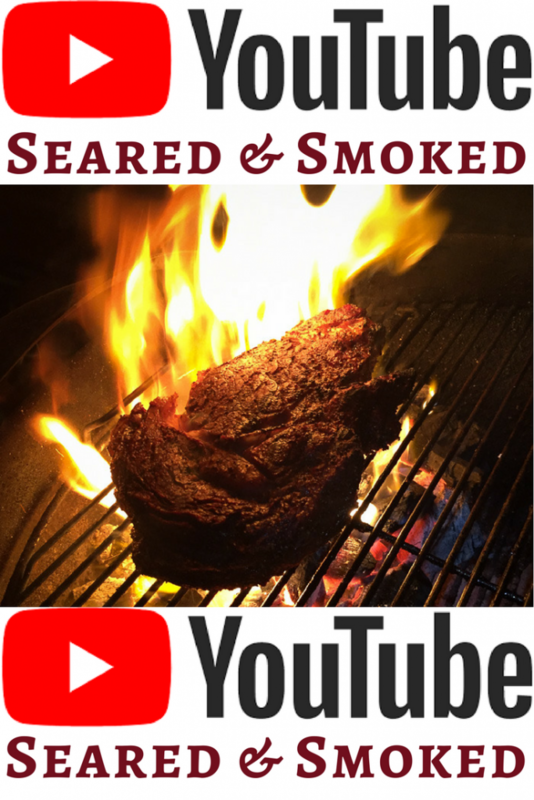 Pull off of grill when internal temperature reaches 165 F in the breast and thigh, or leave on if you want the skin crispier.